Usually this type of dessert is only served around Thanksgiving in my house. However, my local grocery store has this one on the salad buffet and I have to get it every time I drop in for their salad bar. Every. Time. Like I am upset if they don’t have it. And of course, the last two times I’ve been in they haven’t had it. So I made my own. Boom. This one is exactly like my moms Green Salad, but not. Instead of cottage cheese, it has sour cream. And coconut. And mini-marshmallows. Mini-marshmallows folks. Anything with mini-marshmallows has got to be good right?! This is the perfect dish for any time of the year. I’ll be taking it in to the girls in the office to enjoy and making some for my next BBQ! 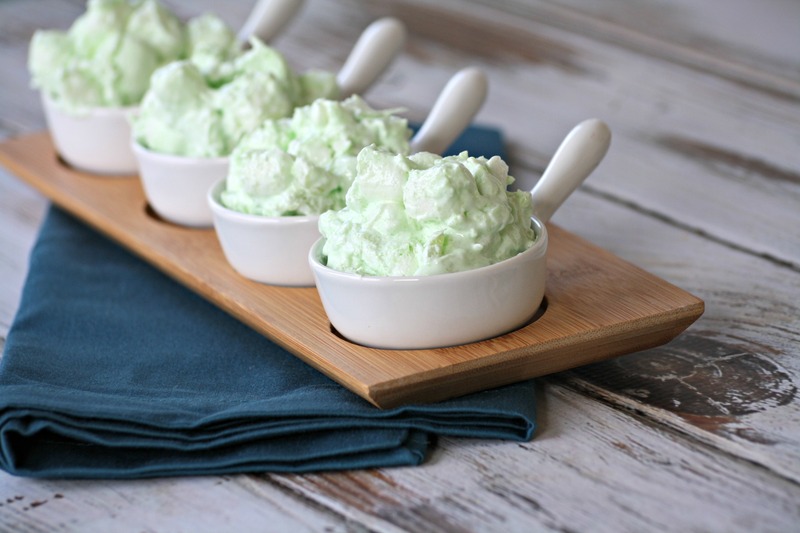 In a large mixing bowl add sour cream, Jell-O and Cool Whip. Mix together to combine until all the lime Jell-O is incorporated. Add pineapple, coconut and marshmallows and fold in. Place in the refrigerator for at least four hours, but preferably overnight. i love ambrosia salads. lime and pineapple sounds great! i also like the sour cream. Thanks! It was so refreshing.